Clint Eastwood's new film honors the members of our country's armed forces showing not only the fierce patriotism, courage and dedication, but also the price they pay in their service. The screenplay by Jason Dean Hall was based on the autobiography of Chris Kyle who served several tours in the Middle East as a sniper charged with protecting the troops on patrol. It's an intense action film which lets the audience experience the often times scary moments while they are doing their job. 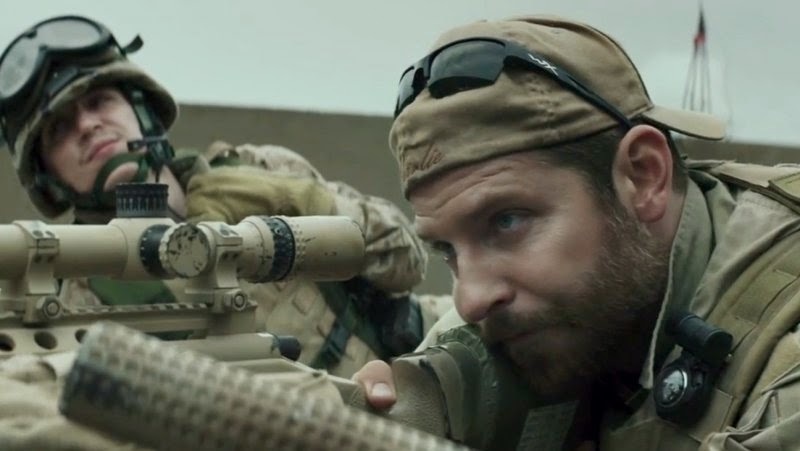 Chris Kyle (Bradley Cooper) was a rodeo rider until 911 happened and he decides to enlist. He trains with the Navy SEALS and has the good old Texas cowboy attitude that helps him endure and thrive in his training. Being raised a hunter by his father who influenced his alpha male mindset, his talent lands him as a sniper. According to his father there are only three kinds of people, predators, victims and protectors. Chris's strong religious faith puts him in the role of protector. It's a simple mindset that he firmly adheres in every step of his life. It's what gets him through the SEALS and helps him pull the trigger no matter what the target. He falls in love with Taya (Sienna Miller), but since their wedding they haven't spent much time together as he's always over seas. She manages having and raising her children while he's deployed. Each time he comes home, she feels he is not exactly managing the transition. The post traumatic stress is effecting him more than he's willing to admit. Plus he's overly driven to return to his comrades in arms. He had built a reputation in the field as having the most confirmed “kills” giving him the nickname “The Legend”. This causes the insurgents to put a bounty on his head. They also have a sniper called “The Butcher” and Chris has made it his duty to eliminate him. The conflict Chris experiences with what he doing and his faith seems to violate the fundamental tenets of the Bible which he carries with him. It becomes difficult for him to return to society and become a father, husband and friend once more. Eastwood does a great job honoring the man and Bradley Cooper gives a performance of a lifetime displaying the inner conflict of a returning veteran. Whatever political agenda is displayed in the movie doesn't distract from the whole realism that war is hell and the price that our young men and women pay for serving our country. Chris Kyle passed away in 2013 and the funeral procession made the newspapers lining the highways in Arlington to the memorial at Cowboys stadium. Eastwood honors Kyle, with an absent soundtrack with stills the audience in reverence.